The Ranger R76LT tyre changer performs masterfully on a wide variety of wheels, including OEM configurations. Featuring ergonomic controls, a tilt-back tower design, advanced clamp positioning and so much more. This professional-grade Ranger R76LT is a tilt-tower machine. Its large turntable provides an internal clamping capacity of 762 mm and an external clamping capacity of 711 mm. A sturdy body, rigid 45 mm hexagonal vertical shaft and hardened‐steel horizontal outrigger support arm eliminate flex during all tyre service procedures to reduce the likelihood of expensive wheels getting damaged. Bead seating and tyre inflation is simple and effortless with Ranger’s exclusive TurboBlast™ portable bead seating system. Ergonomic controls are sensibly placed to minimise excessive reaching, walking, or bending. The proprietary electric turntable rotates secured wheels quickly and safely. While the turntable is efficient, it’s also controlled. This gives low-profile and run-flat beads more time to relax, so they don’t snap off and tear the tyre. Durable, adjustable RimGuard™ wheel clamps are made from hardened steel and expand from 229 mm up to 711 mm. Internal/external multi‐teeth jaws make changing a tyre fast and extremely simple. Your tyre changer is only as good as the clamps that hold the wheel still. Ranger’s advanced positioning system lets you clamp a wheel at any point in the clamping range. Our bead breaker is the smoothest and most reliable we have ever made. It pops beads in a single, swift motion in both directions. The breaker is designed with a stainless-steel cylinder body, so no more moisture contamination or corrosion. Multiple hinges combine with a fully adjustable blade, as well as dual-flange axle that prevents flexing and early failure. The blade can be further adjusted for larger tyres and wheels. A perfectly balanced flywheel reduces stress on the tyre changer. It keeps the machine from rumbling and shaking during operation and greatly extends the lifespan of your tyre changer. Tilt-back towers increase ground clearance, which lets you load and lock larger tyre and wheel combinations. It also makes removing them easier. Perhaps best of all, a pneumatic tool head returns to the same position for like sets of tyres. The R76LT eliminates the need to manually find the right position with every wheel. Ranger tyre changers are made with a specialised drive belt that spreads wear evenly throughout the machine. Belt functionality is not weakened over time, and the entire system is protected by the tyre changer chassis. The hardened steel mount/demount head makes it easy to switch between functions without making adjustments. The tool head is gentle on tyre beads when removing and replacing tyres. We also include a completely nylon tool head for your convenience. The durable nylon construction is exceptionally good at protecting alloy rims and custom wheels. 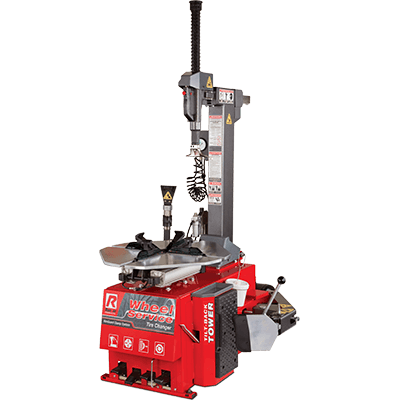 Horizontal outrigger support arms come on every Ranger tyre changer tool head. They help protect the wheels and include a 45 mm spring-assisted hexagonal vertical tool shaft. This setup ensures the tool head remains in the position you need it set. Every moving part in your tyre changer is protected. Linear guide bearings put you in charge of adjusting all wheel settings, and the horizontal arm’s lower roller guide helps keep an even tempo throughout the full motion of the arm. Wear and tear is practically nullified on tower guides and other sensitive components. Our foot pedals control many functions on your tyre changer, so you can safely keep two hands on your work at all times. The single push of a button lets you release tyre pressure at any time. Ranger’s TurboBlast™ bead seating system is one heck of a way to safely and rapidly seat beads without damaging the tyre. A single, powerful burst of air is controlled by a contoured tab that locks immediately after the air blast. These are necessary for shops looking to service bikes. The motorcycle clamps are specially made for motorcycle wheel and tyre sizes.